R Series diaphragm seals feature removable metal diaphragms that can be replaced or repaired as needed over time. The diaphragm is self-retained in the upper housing for easy repair or replacement. This extends the life of the seal element and allows for easy field replacement and service. Type R Series seals have low operating costs and greatly reduce the need to completely replace the entire seal element, even in harsh applications. 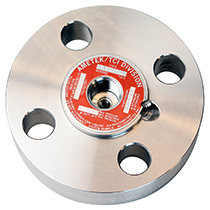 Type R Series diaphragm seals employ a diaphragm retained between two bolted members. In the clean-out design, the diaphragm is situated between the top and middle ring. In the plain design, the diaphragm is located between the top and bottom. Type R Series diaphragms have integral gaskets with a baked-on TEFLON® finish. A VITON O-ring also seals the fill fluid cavity. The seal element’s upper housing is contoured to allow maximum movement and minimal distortion due to improper handling. Type R seal elements have a volumetric displacement of .07 cubic inches.